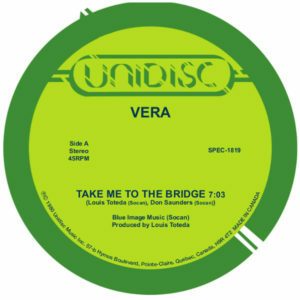 Originally released in 1980 and featuring the vocal talents of Patricia Masi and the production sounds of Louis Toteda (Nightlife Unlimited) this soaring and sultry synth driven Disco jam has long been a favourite among DJ's and diggers searching for those more esoteric dance-floor grooves. Often sampled, edited and copied, the original truly cannot be beaten in any way. A total underground Disco classic! 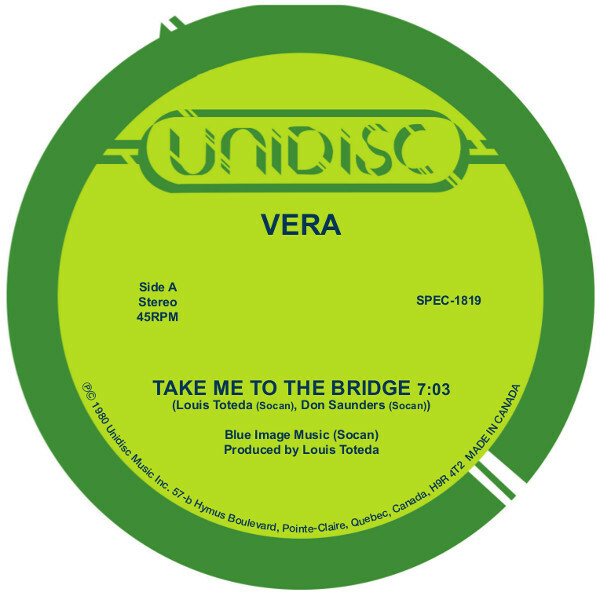 Vera was one of many Canadian studio projects that released on Unidisc during the late 70's and early 80's when the label home to numerous stars of the scene and many hit records. The group cut 2 LP's and released a handful of singles and EP's during their lifespan but the magic of 'Take Me To The Bridge' is what brings us here. Backed with 'Jumpin' (Get Hot, Hit The Spot)' - another piece of slick, synth and vocoder driven early 80's Disco, this record is a long time want for many and original copies can be tricky to track down, often costing quite a bit of money on the used market. Avoid the sharks and purchase this official repress. These are brand new reissues courtesy of the label and have been remastered and repressed using all of the original source material. Above Board distribution are proud to partner up with Unidisc to bring these classics back into the marketplace. Keep them peeled for more top quality represses incoming for 2019.